Microsoft has released KB4345421, a new update for Windows 10 version 1803, the April 2018 Update, yesterday evening. The update is available through Windows Updates but users and administrators can download and install it manually as well. 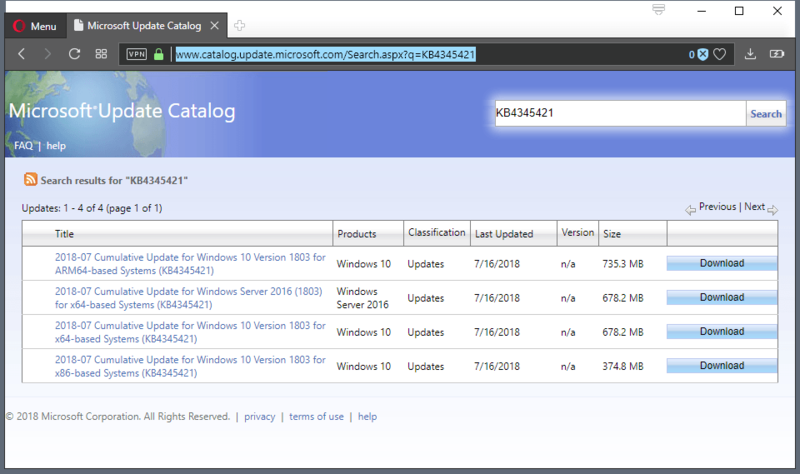 The update has been published on the Microsoft Update Catalog website from where it can be downloaded to local systems. The update is available for 32-bit and 64-bit systems, ARM-based systems, and as a Windows Server 2016 version. KB4345421 is a cumulative update for Windows 10 and Windows Server 2016; this means that you download a full update from the Microsoft Update Catalog website. The update KB4345421 for Windows 10 version 1803 addresses several issues caused by updates released on the July 2018 Patch Day. Microsoft notes that the update does not introduce new features to the operating system. Note that Microsoft may not list all changes on the Knowledgebase page as indicated by "key changes include" on that page. Admins and users have reported these issues in the comment section of our July 2018 Patch Day overview ever since the updates were released by Microsoft. Microsoft states that it is not aware of any issues with the update; this may change in the coming days when admins and users install the new update and report issues back to Microsoft. The past has shown that Microsoft's "known issues" fails to list issues occasionally (or regularly?). Should you install the update? I suggest you only do so if you are affected by one of the issues mentioned in the update's description. Previous Post: « What are Windows 10 Service Stack Updates? Not only manual download imho, my sister got this update automatically from Windows update. Okay thanks, maybe slowly rolled out. I update the article. Also, if you check for updates you may get it. Strange, but the update was available via Windows update early this morning on my computer. A fix to fix a fix. The result of Microsoft having no QA department. Wait…YOU are the QA department. To a degree that’s true, insiders and all. My experience with Linux however is that they seriously have no QA, none. Look at the Mint forums and complaints about bugs & breakages, this has been an ongoing issue with all Linux distros. In the end, Linux has kind of set a bad precedent, rushing projects to market before testing…kind of what Windows & Apple have been doing recently plus more, somewhat forced beta testing by end users. Linux has always used public betas as testing grounds instead of thoroughly doing in house research. Fixing bugs in open source isn’t considered cool but rushing untested distros to market is. I agree Windows 10 is a rather bloated and targeted OS which requires a lot of constant updates to fix the security risks. Linux to some extent also deals with similar issues of a vast hardware ecosystem, and applications. All of which could present issues with fixes, or other updates. Chrome OS is so simple and basic in a OS that it does not have the complexity of update issues other more robust OS have. Chrome OS also benefits from a predictable and known hardware family of devices which makes testing better. In some ways if you can live within Chrome OS it probably is a better system overall for stability. Windows 10 for me is far from perfect and probably never will be with monthly updates. Strange, I have had a irritating problem with delayed internet connection after reboots (a couple of minutes) for almost 2 months on my Win10 1803 system. After installing today’s update the problem is gone. Not sure if it’s within the scope of gHacks Martin, but it’d really helpful if you could write a tutorial on how to integrate Microsoft’s Diagnostics and Recovery Toolset (DaRT) into a Windows 10 ISO, so we could install it together with Windows on our systems. It’s quite a helpful tool. Even better, include in the tutorial info on how to integrate theses cumulative updates on the ISO, to create a killer installation disc/stick. Always love it when Microsoft has to release update to fix previous update. This is becoming a habit for Microsoft which maybe Microsoft should consider a little more time testing before releasing to the masses? Or maybe the fact Windows ecosystem is so vast and complex that Windows 10 updates will never be something we should consider predictably stable?